You don’t ever have to eat frozen pizza again. 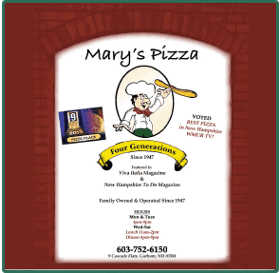 Mary’s Pizza in Gorham, New Hampshire, specializes in homemade pizza and pasta, and allows you to take a bite out of fresh ingredients. Enjoy delicious, made from scratch Italian cuisine whether you are dining in or carrying out at our Italian restaurant. We have a great menu selection, for dinner and lunch. In addition, our restaurant offers daily lunch specials. You may also pair your entree with the perfect wine or beer beverage.